This article explains on the BDCM migration, Permission, resolving issues faced after import. 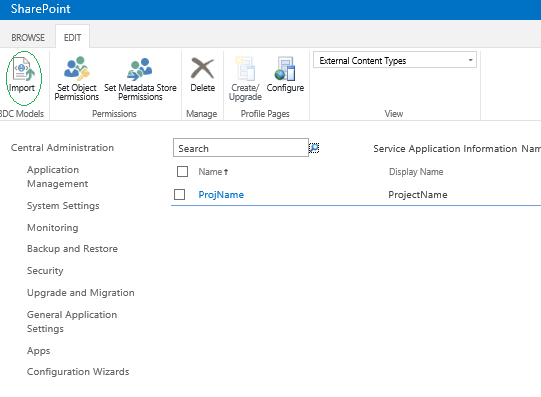 Navigate to Central Administration – Application Management – Manage Service Applications – Business Data Connectivity Service Application. In the BDC models group of the ribbon, click Import. On the Import BDC model page under BDC Model section, click Browse to find the BDC model or resource file. In the File Type section, select the type of BDC model file to import: Model or Resource. BDC model will be validated. BDC model is successfully added to the BDC metadata store. The Namespace should be same before and after import. You can cross-check the namespace tag by opening the BDCM file in notepad.